This Blog is about ironic trope – I know WHAT? It’s a figure of speech, or a play on words that has persuasive power. 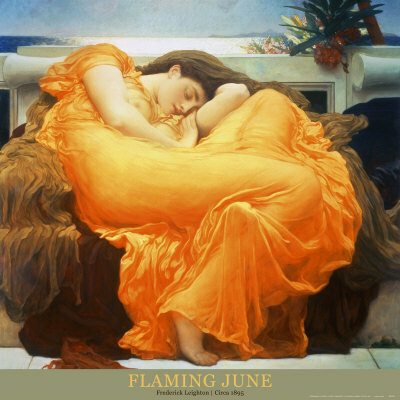 I asked my husband what he thought was meant by the term Flaming June. For him, June is the height of summer. For me it has a completely different connotation. At the beginning of the month, the dishwasher broke down; I duly sourced another from the internet which was delivered 5 days later, only to find it was the plumbing at fault not the dishwasher itself. However, I now have a nice new and shiny dishwasher! A week or so later at 5.30 in the morning I jumped in the shower, screamed and leapt back out again. Three visits later, the boiler man, has yet to discover the cause of the problem. However, it turns out that we have an emersion heater that was quickly put into working order by a really good and decent electrician friend for the price of a beer! Week three and the vacuum cleaner stopped working – phew I wept in relief! That’s the third thing. Plus, I hate vacuuming; any housework actually! Then driving home on Friday to meet the plumber for the fourth time, broke down, called the AA out, to be informed that there was a hole in the clutch pipe. (I am sure there is a technical term). I have yet to discover the ‘that’s great’ response to this piece of fate, especially as the cost is close to £600! I lost internet connection on Saturday – does that mean only one more financial encumbrance looming. Flaming June! What do you reckon to Flaming June?